You’ve probably already heard that adults should sleep seven to nine hours each day. However, many people get far less than what’s recommended. 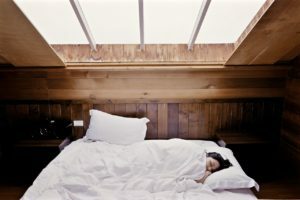 Many people believe they’ll sleep a little extra on the weekends, but sleep simply doesn’t work that way. You need it every day. Lack of sleep affects everything from emotional intelligence to problem-solving and higher-order thinking skills. It should come as no surprise then that getting too little sleep can wreak havoc on your food choices. That’s why many healthy eating plans include getting at least seven hours of sleep for optimum results. The body is a complex system that works together to keep you healthy. When you don’t give your body a chance to recharge, repair, and get ready for another day, you start to see detrimental effects. Recent studies have shown that insufficient sleep contributes to weight gain and poor eating habits because of how the body releases and reacts to hormones. It comes down to this, when you get full your body sends out hormones like ghrelin and leptin that tell your brain you’ve had enough. But, when you don’t get enough sleep, your body doesn’t react as quickly to those hormones, and you overeat. Instead of stopping after the first course, when you’re tired, you may be tempted to have a second or third helping because your brain hasn’t caught up with what your hormones have to say. Eating when you’re tired makes sense if you think of it in an evolutionary sense. If you’re tired, then you must need more energy to survive, unless, as in modern times, you have food readily available. Yes its true! According to Dan Young, he is having the most fun now growing his practice by working less. How is that possible? Well, its all about working on the business, not working in the business. If that sounds counter intuitive, have a listen to this interview to hear Dan tell all about how his practice has grown massively over the past several years and is now on track to reach seven figures in the next few years. Jeffrey: I’m with Filipe Cotas, who’s the owner and head coach at TFW Medway. Filipe, really glad to have you here, and I wonder if you could tell all of us a little bit more about you and your business. Filipe: Hey, Jeffrey. Thank you for having me, it’s an honor. I am the head coach and owner of TFW Medway. We are one of the 300 affiliates worldwide which we do the Training for Warriors program under the tutelage of Martin Rooney. We basically just build our…our mantra is build muscle, lose fat, feel good. We see a good vast amount of clientele anywhere from your average adult to also your athlete, anywhere from the ages of about 8 to 18 years old give or take. We just basically go after their goals and just try and improve everybody’s, you know, livelihood and such. It’s a pretty cool opportunity to help everybody get better. Jeffrey: Fantastic. Now, we chatted a while ago and you had just moved into a larger space, and at that time it was about 4,500 square feet. Maybe you could talk a little bit about your journey and how you kinda started out where you were working with someone else, but you want to go out on your own. How did you make that decision and make it happen? Filipe: Well, I’m 30 years old right now, and, I mean, I’ve been working out ever since I was 14 years old. Got certified right when I turned 18, and at that point on I decided I wanted to, you know, really go for it and really make this a career out of it. At that point I started reading and listening to a bunch of…well, there weren’t really any podcast back then, but reading a bunch of blogs that probably a lot of people are well known. Guys such as Charles Poliquin and Jason Ferruggia and such. Really just told myself, if these guys can do it, why can’t I? Dr. Roger Adams talks about how he manages his practice for incredible referrals from satisfied clients. Interviewer: I’m pleased to have with me Dr. Roger Adams, who operates Eat Right Fitness, out of Spring, Texas. And Roger’s been doing a lot of work in his practice and today he’s going to share with us some of the things that he uses to help make his practice more effective and also tell us a bit more about where he focuses and some of his concentrations. Roger, we’re really glad to have you here. And if you could please tell us a little bit more about yourself and your practice. Dr. Adams: Thanks for having me, Jeffrey. I think this is going to be fun. My name is Roger Adams and I’ve been in the practice, at nutrition counseling and personal fitness training, for about nineteen years. I primarily work with clients on weight loss and sports performance. So I will see patients that need to lose weight, either it’s for health reasons, such as chronic disease like diabetes, obesity, heart disease, or maybe it’s just some vanity weight. They want to lose a few pounds before the summer vacation. And then I also work with them on exercise prescription and make sure they’re doing the right kind of exercise to meet their goals. I work with clients one on one and in personal training settings and also in small group fitness locations. Jeffrey: And Roger, do you do any coaching online or through some sort of distance application? I recently had the pleasure to chat with Dan Young, Certified Naturopath from Cheyenne, Wyoming. Dan runs an interesting practice, and he’s got a great method for getting new clients in the door. He also has some interesting ways that he’s able to retain his existing clients and develop fantastic word-of-mouth referrals for all the hard work he puts in. Jeffrey: I’m pleased to have Dan Young, board certified naturopath from Cheyenne, Wyoming here, with me, on the call. Dan, it’s great to have you here. Dan: What an opportunity, thank you for the time we’re going to spend together today. Jeffrey: Dan, I wonder if you could explain to everyone a little bit about your practice. Dan: In 1998, my father found himself retired as a master herbalist, and because of some of our past history in our family, he was very moved and wanted to get back into doing some form of work. He actually became a master herbalist as a hobby. It wasn’t really intended to be a business per se, but in Torrington, Wyoming, a little town just north of Cheyenne, he started consulting and working with people, and that was 1998. Today, several years later, we have found ourselves in a rather large business situation here in Cheyenne, close to 2500 square feet of just clinical office, plus we have a registered FDA lab for manufacturing our herbal-based dietary supplements, and we are very blessed to see over 4000 office visits a year now. So, it’s been quite a journey. Interviewer: I have with me Gary Merel who is a licensed acupuncturist and functional nutrition practitioner based in Ann Arbor, Michigan. Gary, I wonder if you could explain for the folks a little bit about your practice? Gary: A simple question. I would say my practice is focused on primarily three components. I’m an acupuncturist. I went to acupuncture school in New York, I don’t know, many years ago, and am licensed in the state of Pennsylvania. But I found over the course of my first years in practice that I was unprepared to deal with the complexity of patients’ presentations that came into my office. I’m also an inpatient practitioner, an inpatient clinician, I like results. Also, people pay out of pocket, so, it’s not like I have an infinite amount of time. There’s usually a personal investment clients make in coming to see me. So, I started studying functional medicine, and I would say, functional medicine uses the tools of medical science, but unlike most allopathic practitioners, functional medicine, well, let me say this differently. Allopathic medicine, for the most part, not exclusively, is really based on symptom management. You have symptoms, they have drugs or procedures to manage them. Functional medicine is really rooted in finding out the underlying cause. Symptoms don’t live in a vacuum, our bodies don’t live in a vacuum. The knee bone is connected to the shin bone. So functional medicine uses the tools of science, which is blood work and some other diagnostic tools – saliva testing, urine testing – to help figure out why the symptoms are appearing and using that knowledge to empower my clients to own their health, and, as often as possible, resolve that underlying condition, and in most cases, the symptoms just take care of themselves. I also use nutrition as a big part of my practice. I have a very Paleocentric practice. I use food as a primary source of healing. I do use supplements, but food always comes first. Seventy percent of our immune system is in our gut, so you need to deal with that first. I find between using the tools of acupuncture and Oriental medicine and functional medicine, I can bring the best of both worlds to help a client in the process of healing and ultimately making health a choice.